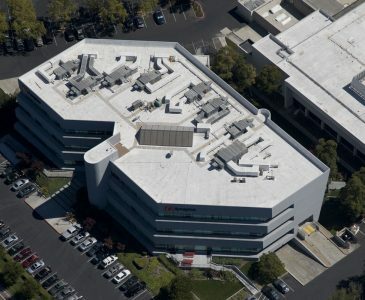 When LinkedIn purchased this existing concrete tilt-up commercial building in Sunnyvale they wanted to do something special with their renovation. 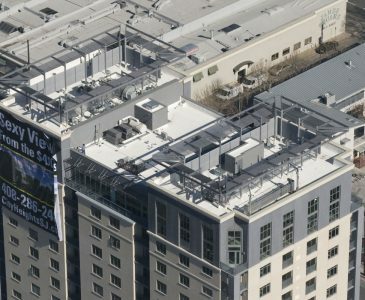 California has a building code requirement coming in 2030 that all commercial buildings will have Zero Net Energy (ZNE) use. 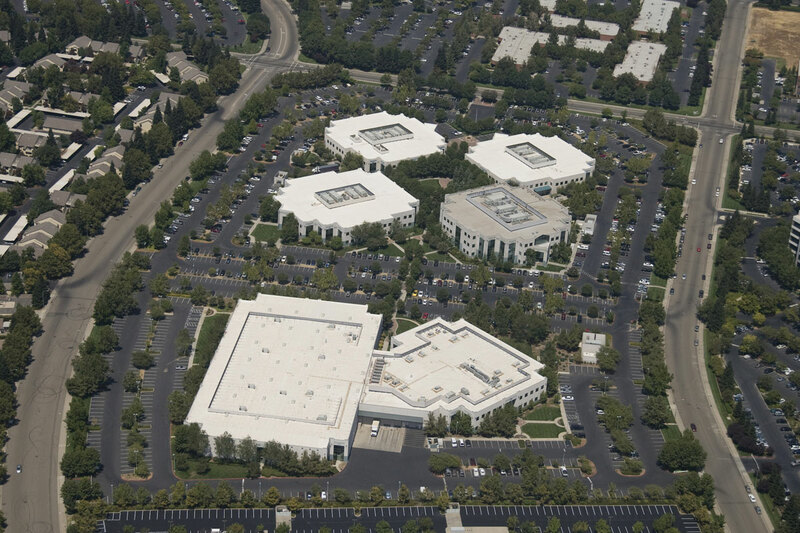 LinkedIn made the forward step to upgrade this building to ZNE well ahead of the upcoming California requirement. This renovation required that all systems be of the highest possible efficiency, including the roof. 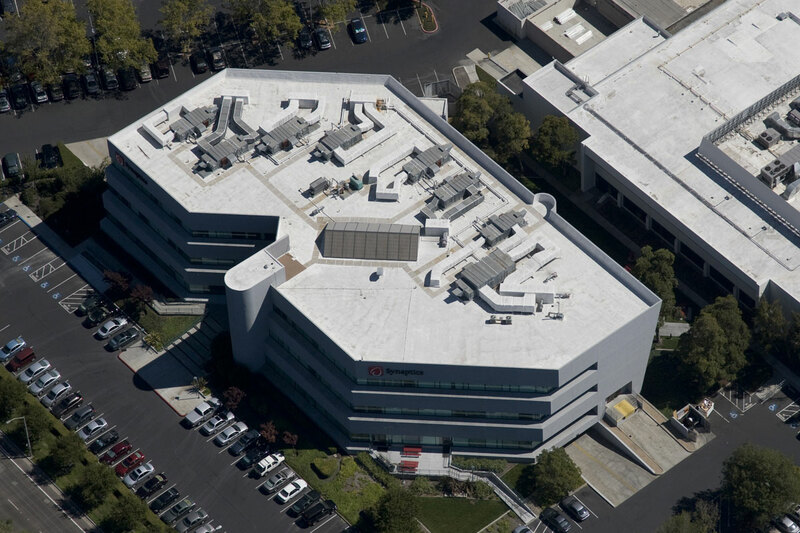 CCC installed a four-inch-thick SPF roof which provided R-25 of continuous insulation for this commercial building in Silicon Valley. However, with no gaps and no fasteners, the monolithic SPF roof provides higher performance insulation than rigid insulation board systems. This fully adhered SPF system also allowed the exposed wood ceilings to be free of unsightly fasteners being visible through the roof like when rigid insulation systems are installed. The Bee Sweet processing plant includes several conjoined metal buildings, with a combined square footage over 250,000 square feet. Bee Sweet wanted improved waterproofing, a common issue when metal buildings are conjoined. 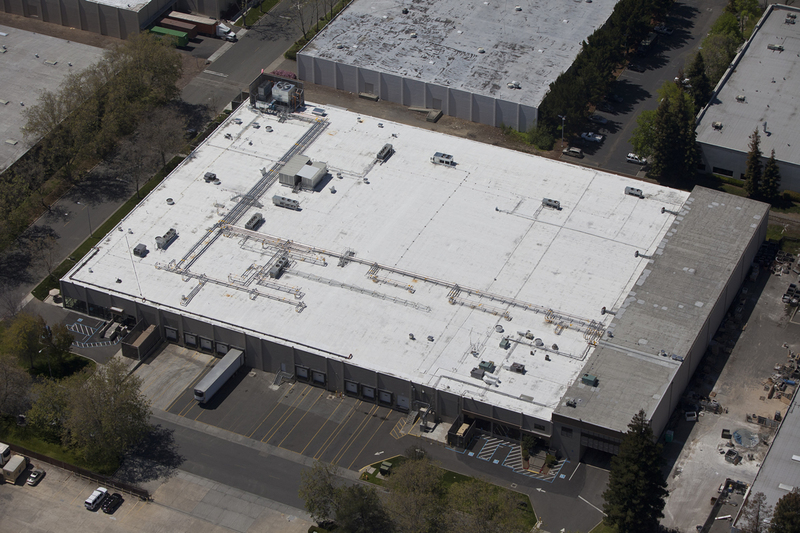 They opted to add 88,600 sf of spray polyurethane foam (SPF) roofing to an existing 133,720 sf SPF roof. 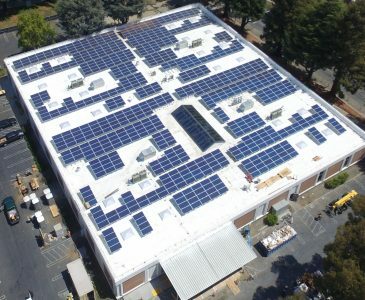 To maximize energy efficiency, they concurrently replaced and sealed 54 skylights, and added a 2.4-megawatt photovoltaic (PV) system with over 7,400 solar panels requiring 7,487 standoffs, each penetrating the roof and requiring a leak-resistant seal. Environmental stewardship is one of Bee Sweet’s corporate priorities. Their commitment to be as environmentally friendly as possible in every step of the growing, picking and packing process drove the decision to upgrade their processing plant to conserve electricity and minimize their environmental footprint. 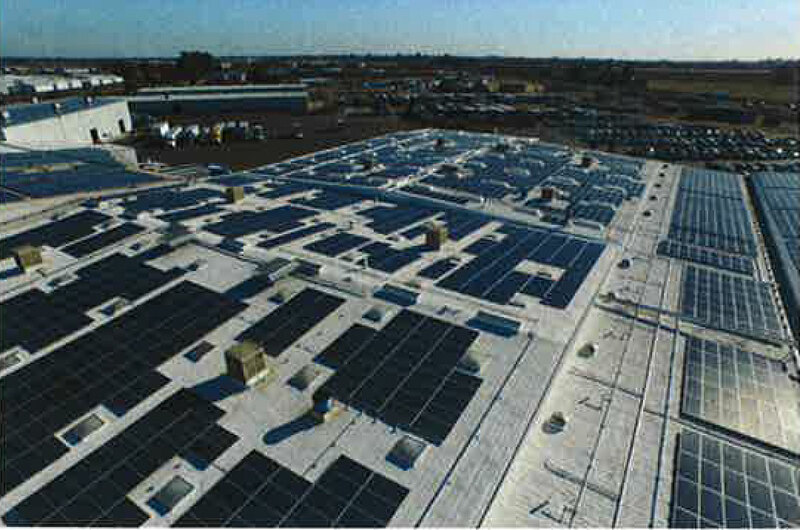 This complicated project included SPF roofing, skylight replacement, and installation of a large rooftop PV system. 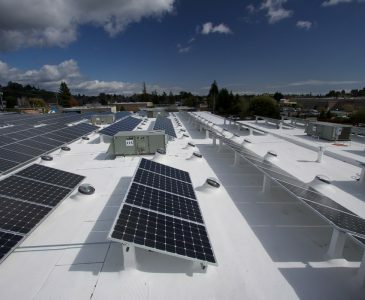 Although the existing SPF roof was already in place, more roofing was needed when the decision was made to add the solar panels. 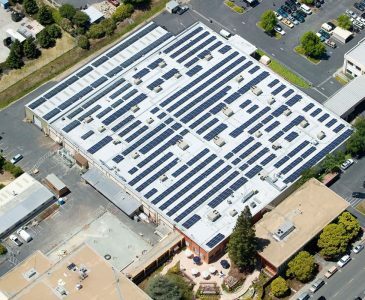 Bee Sweet selected a 2.4-megawatt PV system that covered almost the entire plant, including the existing foam roofs and citrus processing area. 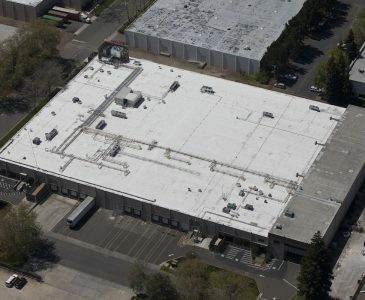 The 88,600 sf processing area had experienced many leaks and needed additional insulation, so a new foam roof was added prior to PV system installation. 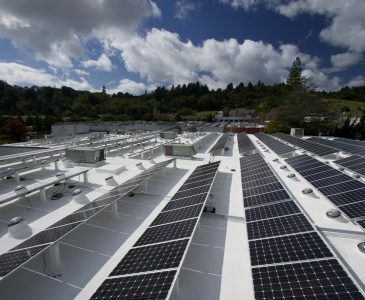 The massive PV system required a staggering 7,497 standoff brackets fastened into the roof as structure. More than one-third of these brackets were sealed as the new SPF roof system was installed. The remaining brackets had to be installed and sealed in the existing foam roof area. 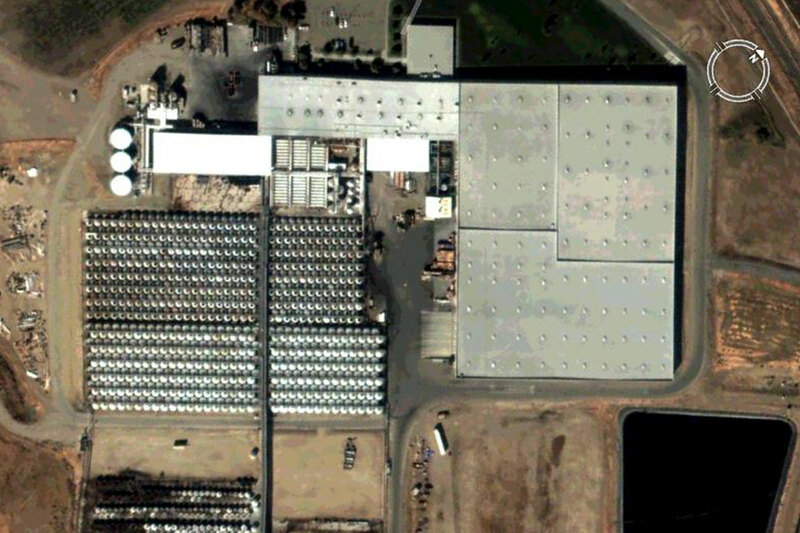 Additionally, the processing area had 54 fiberglass skylight panels that were failing. 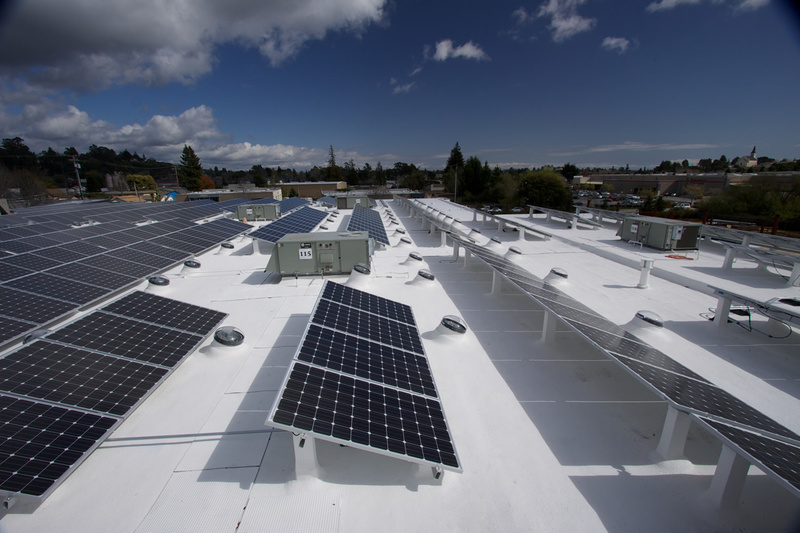 SPF contractor Central Coating Company removed these panels and installed and sealed 54 new curb-mounted, double-lens skylights to improving lighting and increase safety. Despite the size and scope of this project, all work had to be performed without disrupting daily business operations. This existing standing seam metal roof had been the source of past roof leaks. 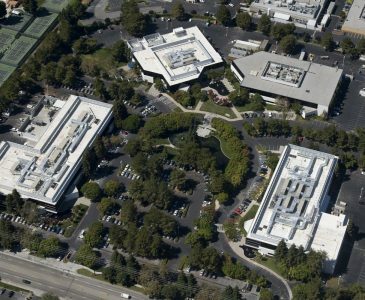 In addition, this building was due to receive a daylighting upgrade to match the other campus buildings which use hundreds of Sun Tube skylights to provide natural light to the work spaces. 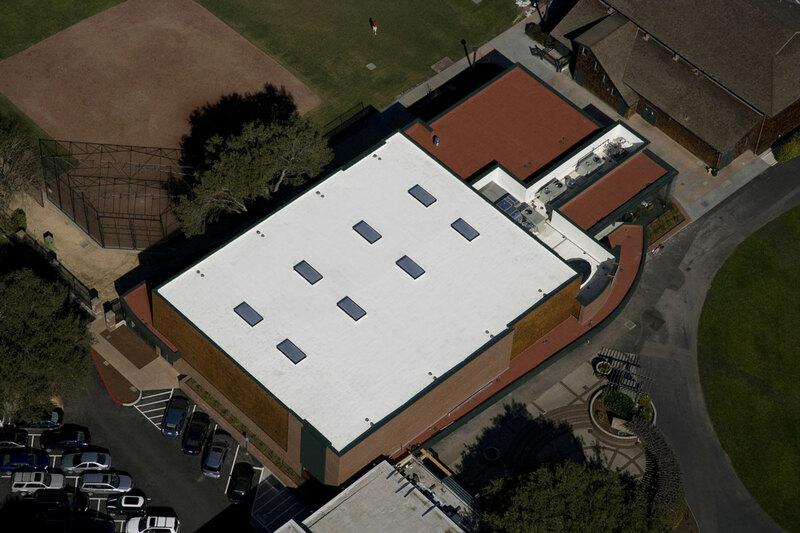 CCC installed a new sprayed foam roof to waterproof and insulate the existing metal roof. During the project several dozen new Sun Tube skylights were installed which bring daylight into the work spaces below. The existing tar and gravel roofs on the hotel had been a source of leaks for many years. 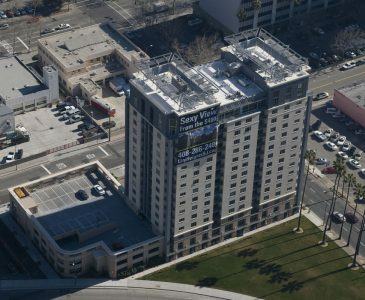 After researching many different roofing systems, the ownership found that a foam roof by CCC would provide the best solution at the best price with the least impact on the hotel. The project was complicated by the roof being separated into many different section on several different levels. Also, noise and disruption were a big issue as the hotel lodges flight crews arriving from Asia into SFO airport. CCC removed the surface gravel and prepare the existing roof to receive SPF roofing. CCC also had to perform an extensive amount of detailed preparation work around HVAC units, electrical panels and cell phone equipment. This difficult project required daily coordination with the hotel staff as the flight crews arriving from Asia had to be placed in rooms that would not be disturbed by that day’s roofing activities. The SPF roof on Paramit’s building was originally installed when the building was constructed. 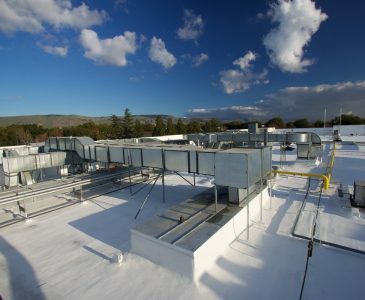 The foam roof was performing well and had at least five years of life remaining before a recoat would be required. 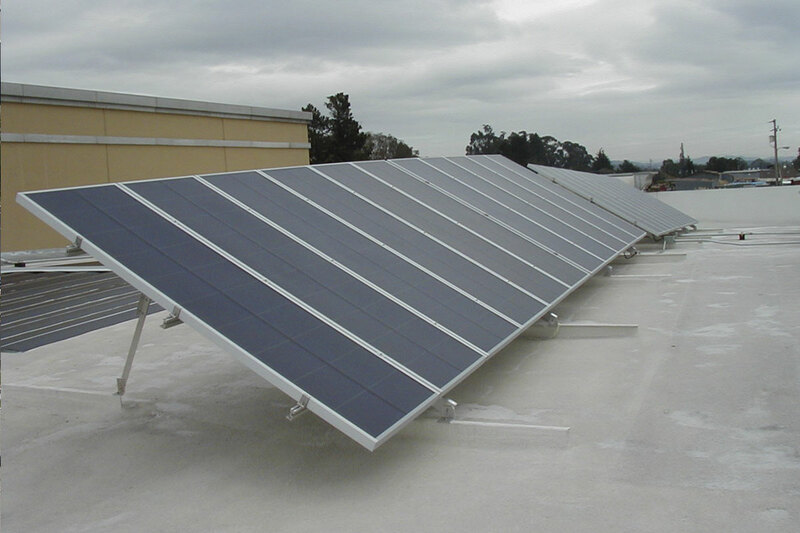 However, Paramit wanted to install a roof top PV system which would cover the entire roof top. 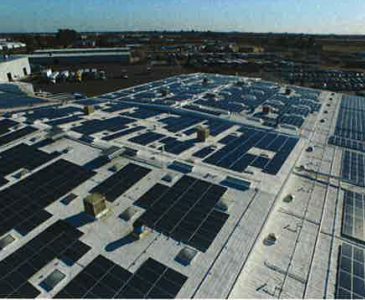 The ownership made the decision to have CCC recoat the roof to match the lifespan of the roof with the lifespan of the solar panels. CCC cleaned and pressure washed the surface of the existing roof. The roof was then recoated with a high tensile strength acrylic coating and a fresh application on granules. The roof was warranted with a 15-year manufacturer’s warranty. 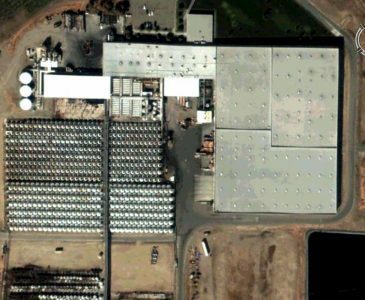 After recoating, it is expected that the foam roof will provide another 25 years of performance which is the same as the performance expectation of the solar installation. 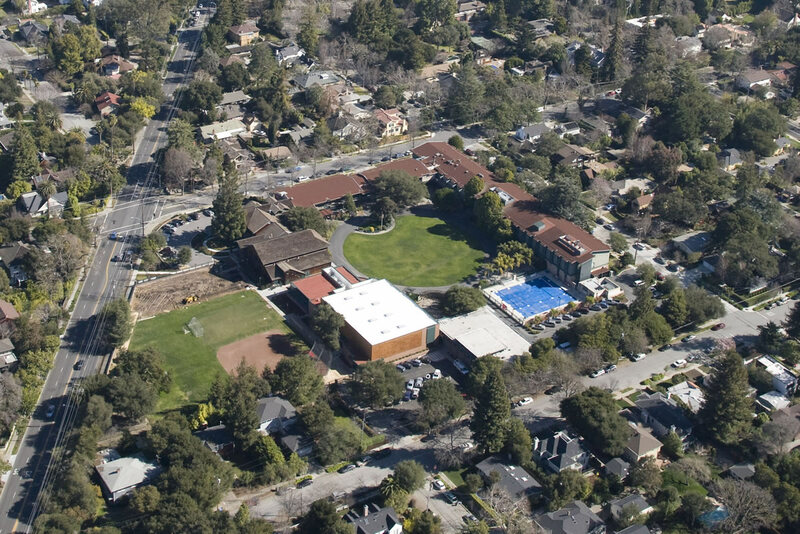 The existing 1960’s era classroom and administration buildings were in need of a new roof and the lack of existing insulation led to classrooms which were nearly impossible to heat and cool to a comfortable level. 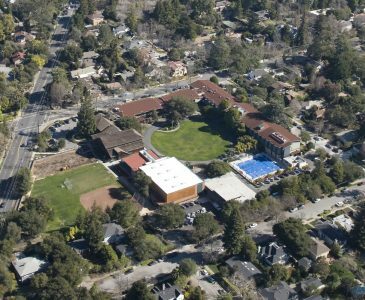 Beyond providing a roofing and insulation solution, the new roof needed to maintain the aesthetic of the existing volcanic rock roofs while meeting the CalGreen Code requirement needed in Palo Alto. 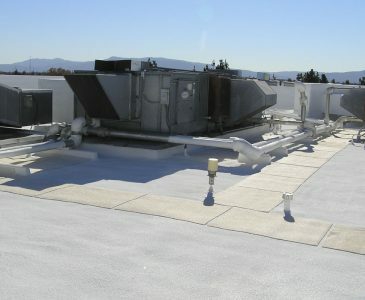 CCC installed a Spray Foam roof providing R-30 insulation. Instead of the standard white topcoat and granules, CCC installed a custom color, “Spicy Hue” to match the existing aesthetic. 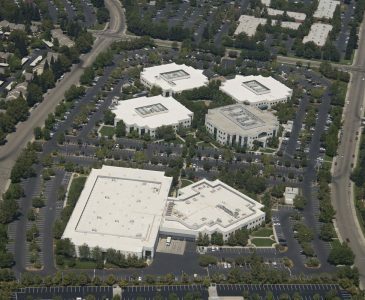 The reroofing of this building followed the change of use of half the building from labs to office. On the remaining office side, a large amount of mechanical and process equipment was present requiring careful detailing of the roof. On the office side hundreds of abandoned sleepers, curbs and penetrations were present. CCC installed a new SPF roof system which provided roof insulation, increasing the building’s thermal insulation by over 40%. During the project CCC’s crew demolished all of the abandoned sleepers and equipment platforms requiring 3 crane lifts to remove all of the debris. 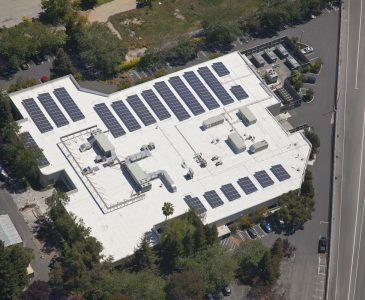 The reroofing of this Google building proved to be a challenge due to the presence of a large amount of HVAC and process piping as well as over 400 solar panels. 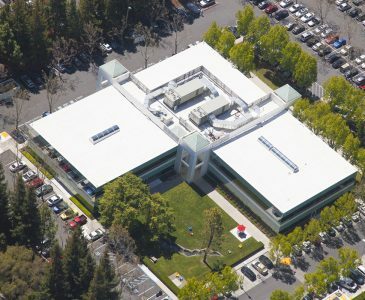 Google turned to CCC for the roofing solution. 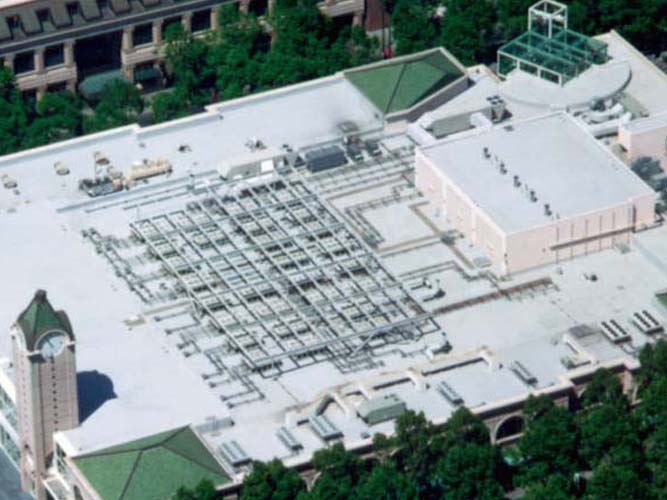 By using the sprayed in place roof system, CCC was able to provide a long lasting roof system without removing any equipment or affecting the production of the photovoltaic system. Columbus Salami occupied this building as a distribution center. In 2011, Columbus moved their salami slicing and packaging operation into the facility. 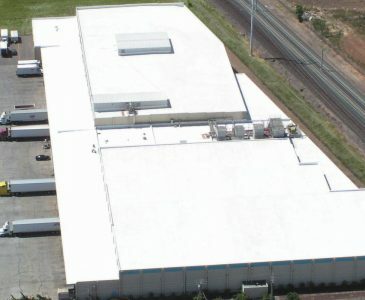 Columbus looked to CCC to install a new foam roof to insulate and protect this food processing facility. 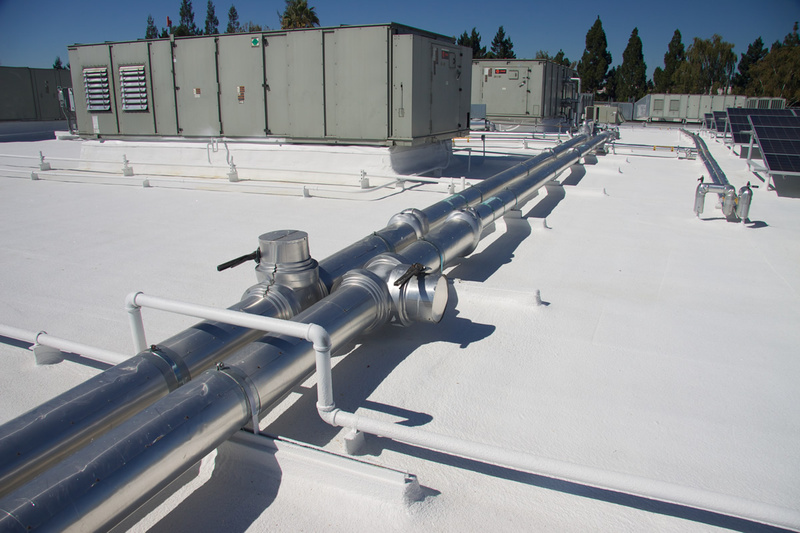 CCC installed a new SPF roof system working with the general contractor to seal the many complicated penetrations for cooling equipment. 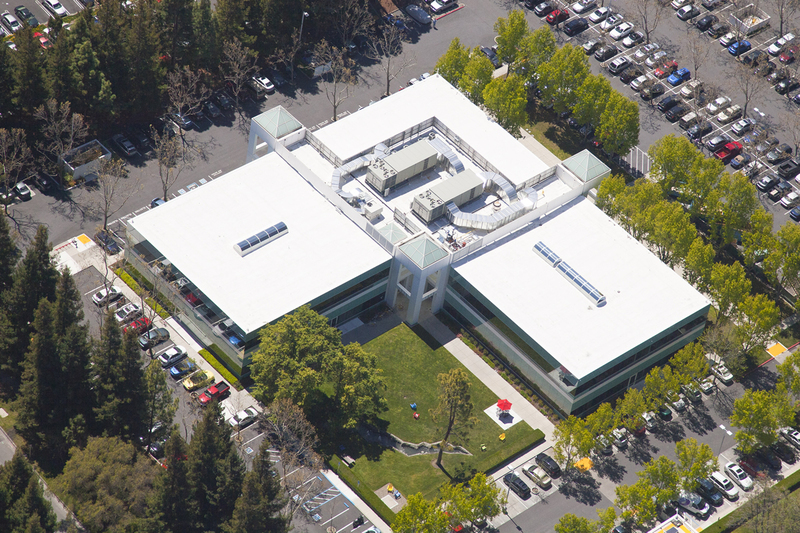 During the renovation of this building, Google replaced all interiors, mechanical equipment and the roof. 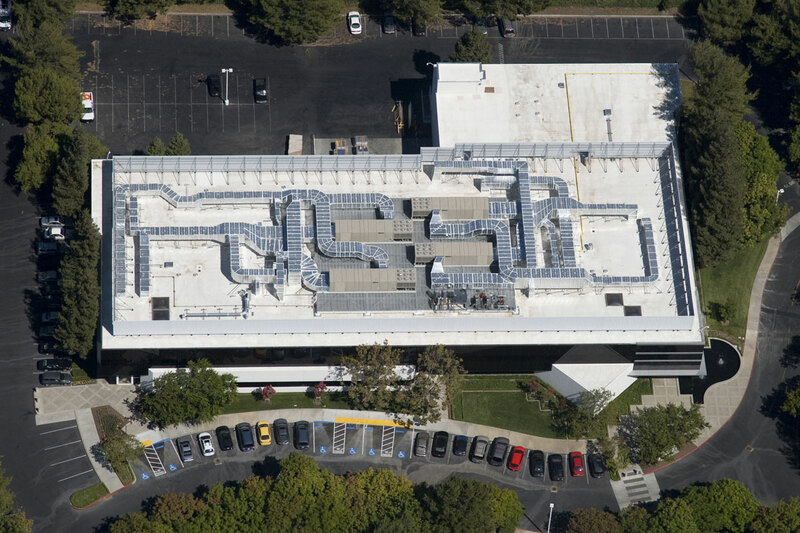 Google turned to CCC to provide an insulated roofing solution as part of this fast track renovation project. CCC installed a new foam roof in a phased approach, allowing the old rooftop equipment to be removed and new equipment installed while maintaining a watertight roof in the rainy season. 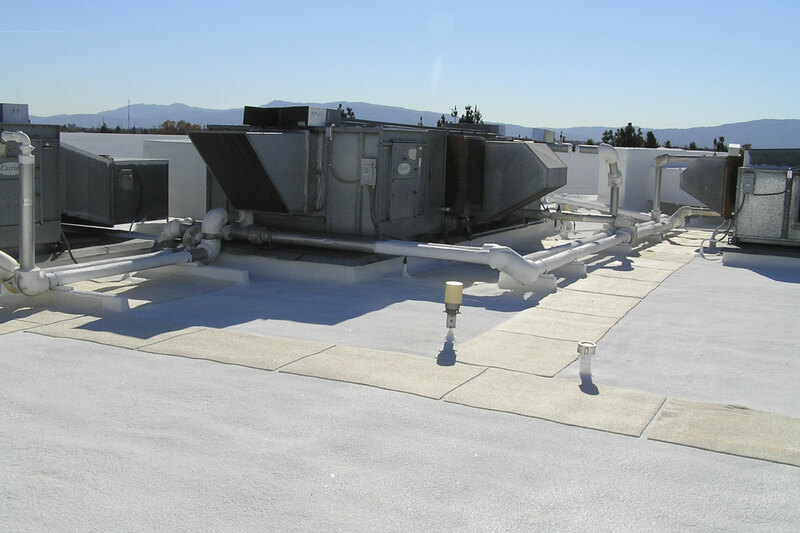 This project received the Spray Polyurethane Foam Alliance (SPFA) National Industry Excellence Award in 2005. 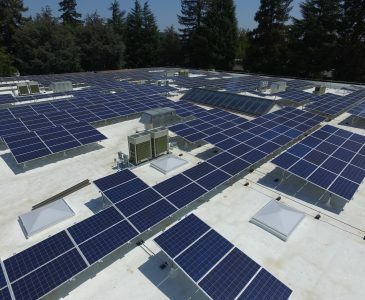 Install a photovoltaic (PV) solar panel system on roof of a building where an engineer had determined that the roof”s loading capacity was at its limit and no additional weight could be added. 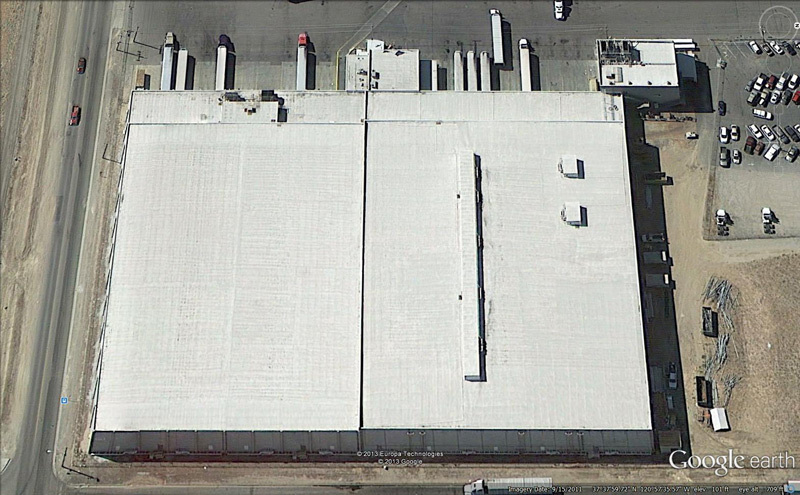 The existing built up roof (BUR) was torn off and replaced with a light weight SPF roof system resulting in roof loading reduction of approximately 120,000 lbs. 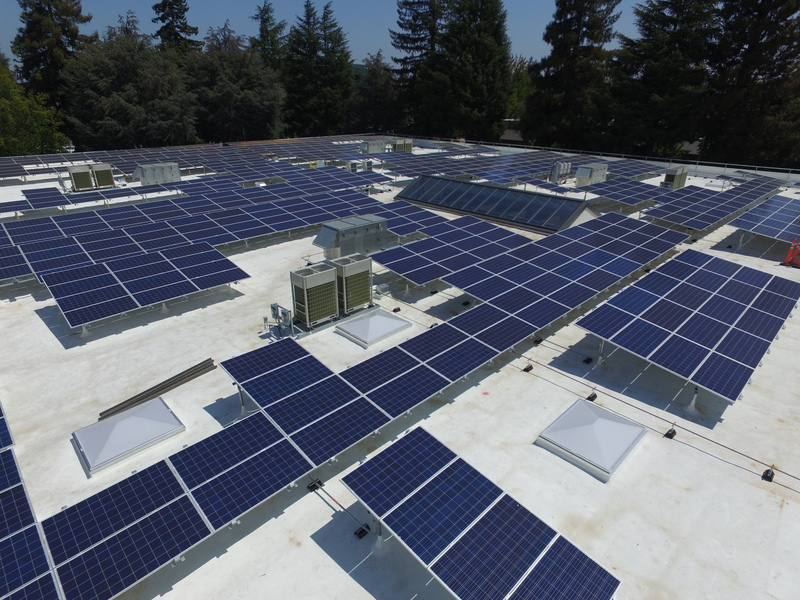 The resulting reduction in roof load allowed for installation of a 267 kW PV system. 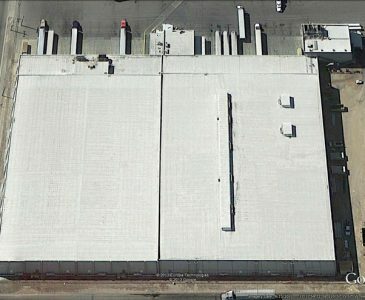 This refrigerated storage and logistics warehouse was experiencing high energy bills and had difficulty maintaining temperature on hot days in the San Joaquin Valley. At the same time the existing built up roof had reached the end of its useful life causing water and vapor leaks. 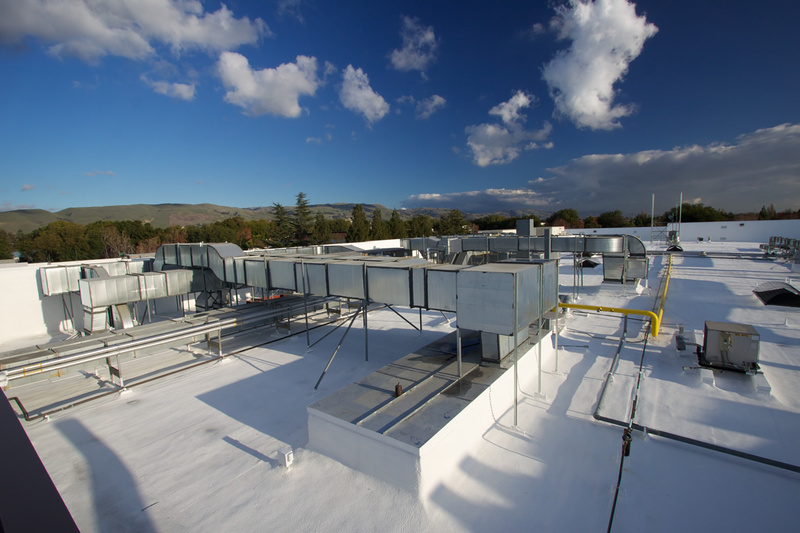 CCC installed a new sprayed polyurethane foam roof system with a vapor barrier coating. This stopped the leaks and increased the roof insulation providing substantial energy savings. Provide a Title 24 compliant roof system as part of a project to convert older existing buildings into a 21st century home for one of the country’s leading high tech companies. Tear off BUR capsheet roof system. Apply one inch of SPF to plywood decking followed by bright white high-performance “Cool Roof” coating system. 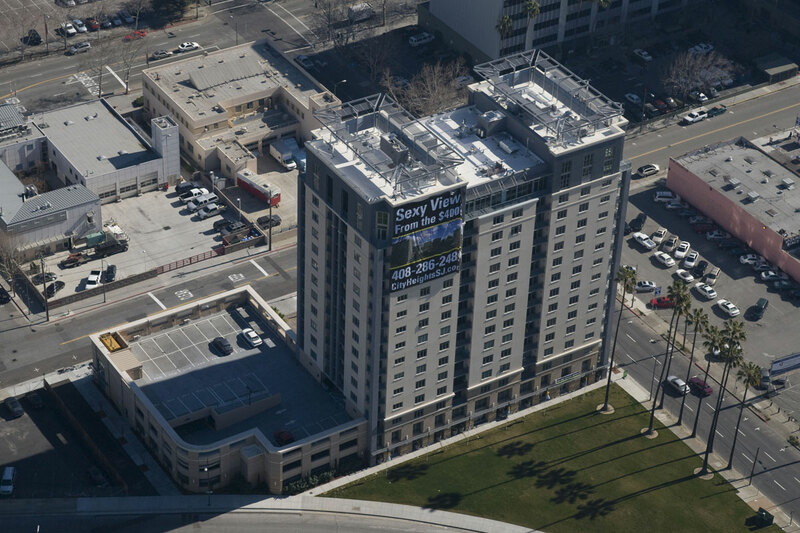 This project received the Spray Polyurethane Foam Alliance (SPFA) National Industry Excellence Award in 2007. Complete project during short summer vacation period. Gymnasium ceiling was left exposed requiring that no mechanical fasteners could penetrate the roof deck and be visible from below. All foaming completed before school started and coating application phased around first days of school year. Insulation requirement for project was R-22. 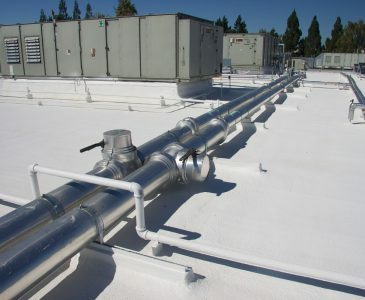 To achieve this, high-density polyisocyanurate boardstock was secured to the top of the fluted metal deck using Dow Chemical Insta-Stick Adhesive instead of mechanical fasteners. Then two 1 inch passes of SPF were installed over the boardstock. 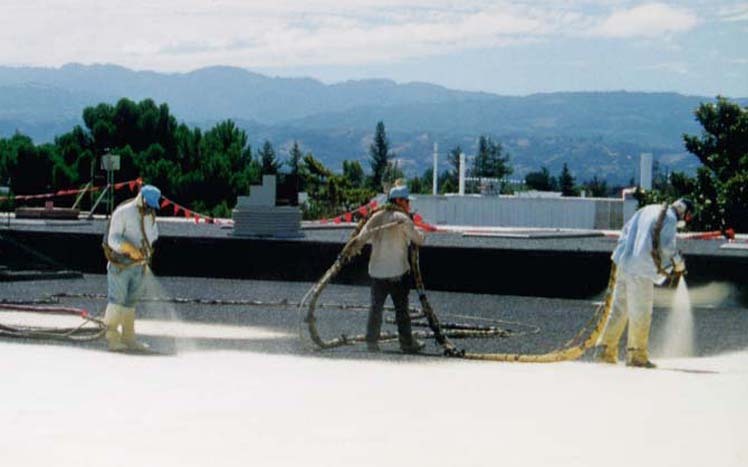 On the “dead flat” roof areas tapered passes of SPF were installed to form slope to drain at ¼ inch per foot. At its thickest point the SPF is 8 inches thick. 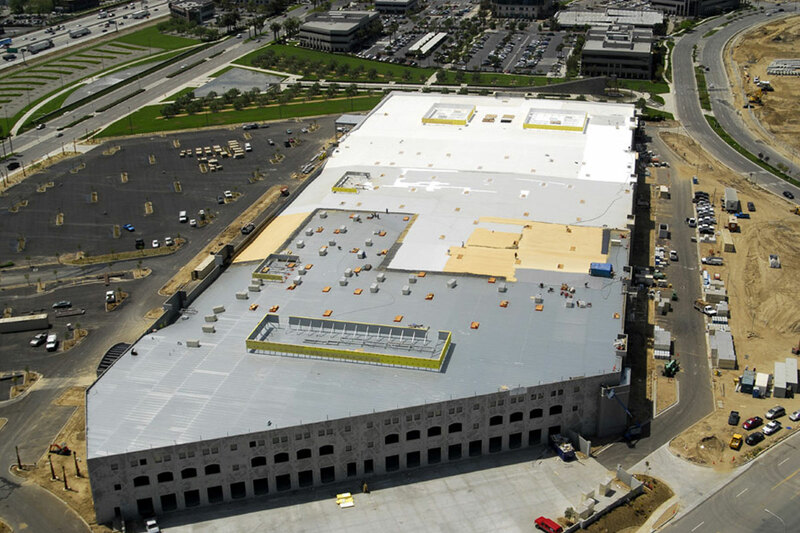 CCC provided the insulation, slope to drain system and roof membrane within its scope of work. Having three separate scopes of work performed by one trade saved time and money for the client. CCC mobilized two crews, two foam rigs, and a dedicated rigid insulation board installation crew. 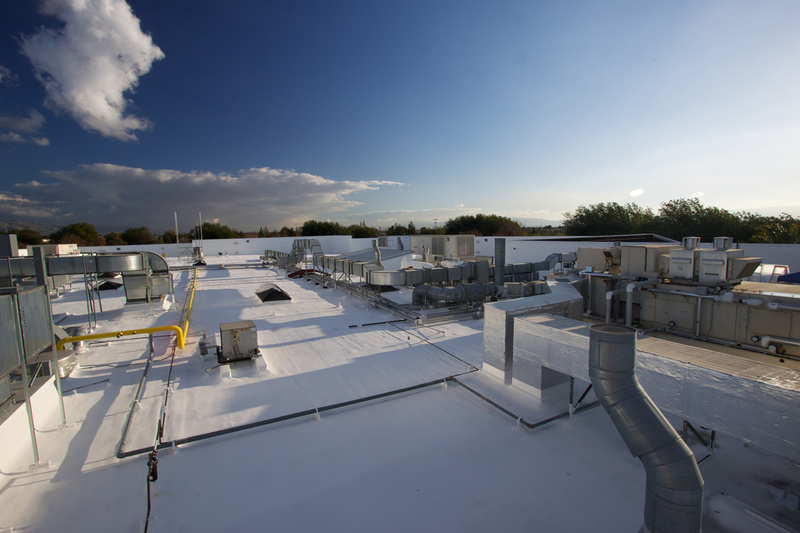 In open areas of the roof CCC was able to install the rigid insulation board and sprayed polyurethane foam at a rate of 20,000 sq. ft. per day. The project was finished ahead of schedule. The roof system had to be installed to meet Factory Mutual’s 1-90 Wind Uplift Rating due to the high winds common in the Ontario Area. 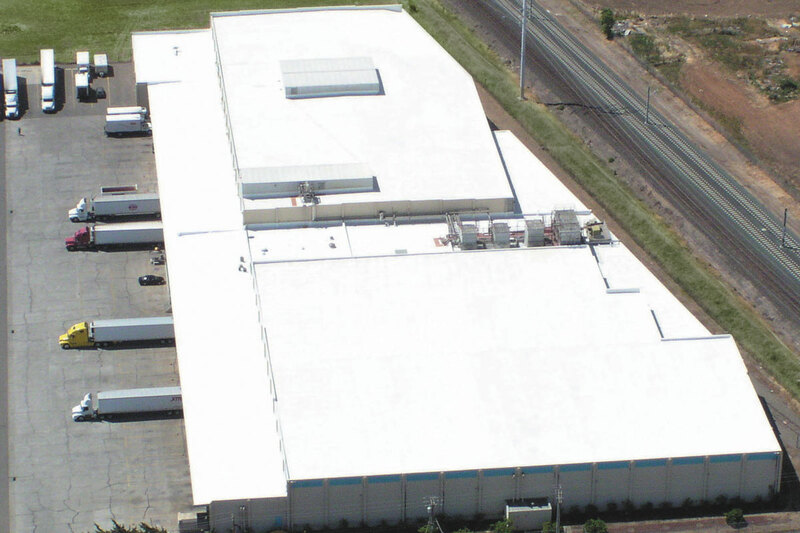 SPF roofs offer the best wind uplift performance of any commercial roof system. The roof system provides R30 insulation over the showroom and office and R19 insulation over the warehouse. 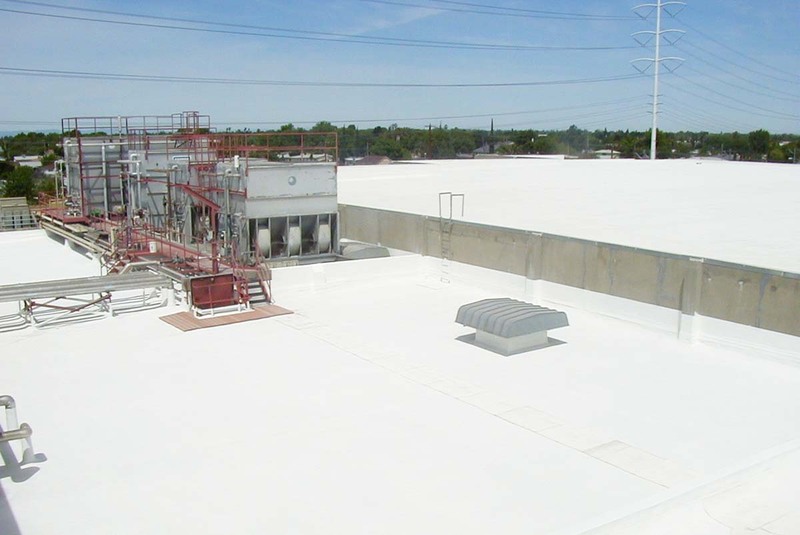 SPF roof system was coated with bright white highly reflective coating to meet “Cool Roof” requirements. -Tony Ageno, Project Superintendent, Devcon Construction. 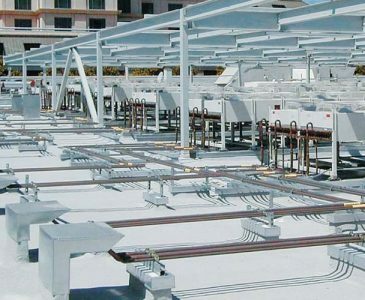 Provide a high performance insulating roof system for a highly leak sensitive client on a building with literally hundreds of roof deck penetrations. Install (3) one inch thick passes of SPF over a properly prepared and primed concrete deck. 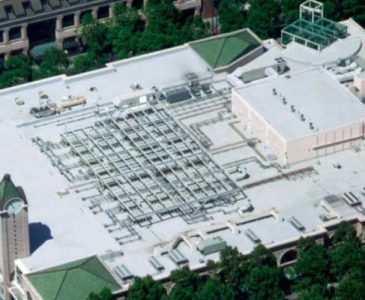 The unique self-flashing capabilities of SPF were utilized to form cones and cants around hundreds of roof penetrations. 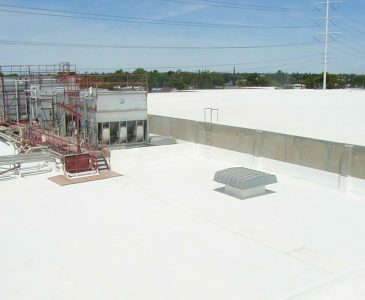 High performance GE Silicone coating system and 3M ceramic granules were installed to protect the foam from UV radiation and roof traffic. This roof was designed to protect this building and its contents for the life of the building. Re-roof all 17 buildings of a large apartment complex as one project. The owner was fed up with the persistent roof leaks. CCC was hired to do the job right. 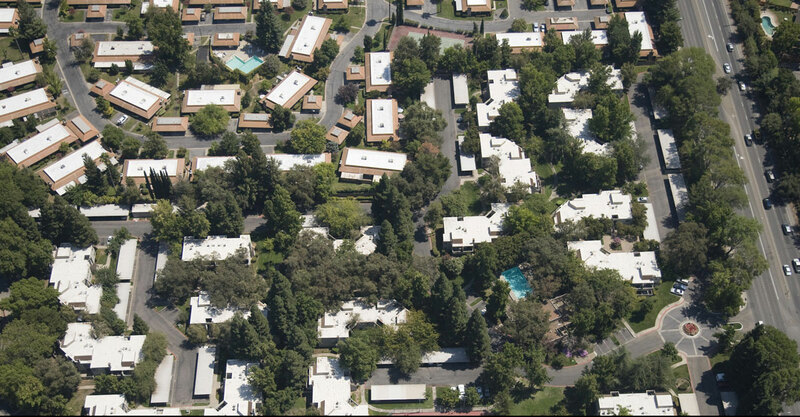 CCC followed a phased approach completing 4 buildings from each set up location. 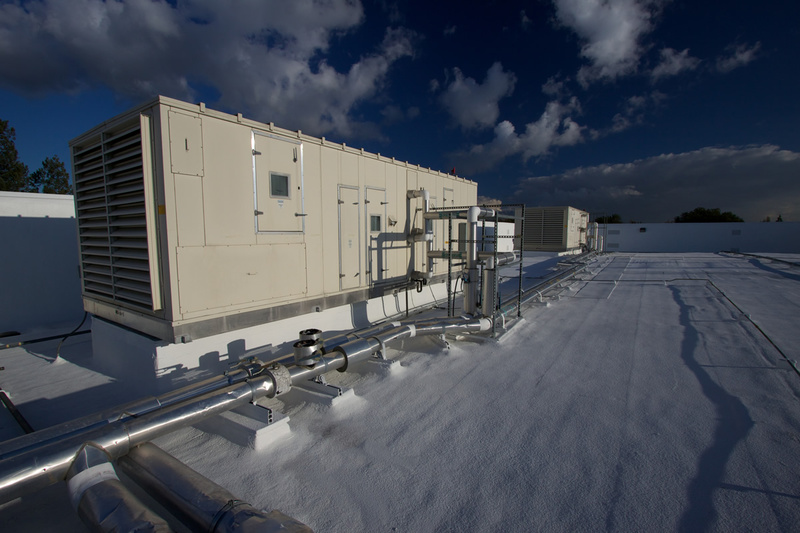 The roof added R-9 of insulation and upgraded the buildings with Cool Roof technology. Due to the shape of the buildings the preparation and sheet metal details were very complicated. CCC replaced over one and a half miles of edge flashing and 198 scuppers with new downspouts. The project was completed on schedule and will provide decades of leak free performance. Replace an aging tar and gravel style built up roof without disrupting the operations of a high-tech client. In addition to the roof leaks, the large amount of duct work present on the roof was also the source of water leaks and air leaks. 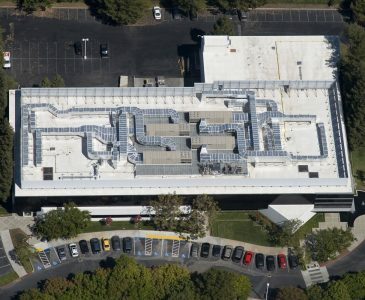 The large HVAC system including several hundred linear feet of chilled water supply & return piping made for a challenging installation. Preparing this roof for foaming involved removing the surface gravel using a high powered wet vacuum. This provided an excellent substrate for the new roof without the expense and inconvenience of a tear-off. 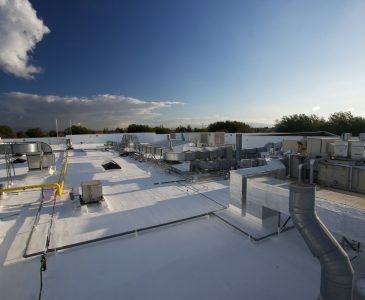 CCC installed 1-1/2 inches of SPF over the roof and also foamed several thousand square feet of ductwork. The duct foaming provides a huge increase in energy efficiency by stopping air leaks and adding insulation to the ducts. 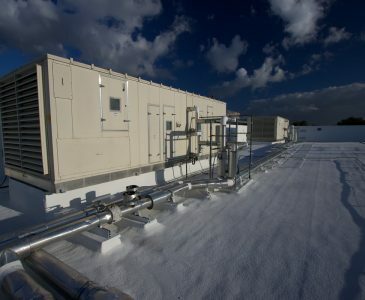 CCC used its proven flashing and preparation techniques around the HVAC units and piping. 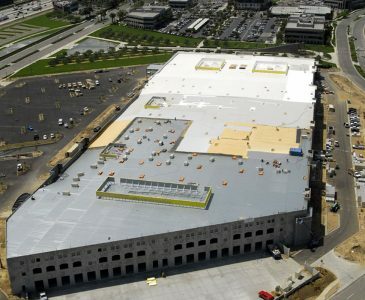 On this project CCC once again proved its ability to provide a high quality roof on an occupied facility. 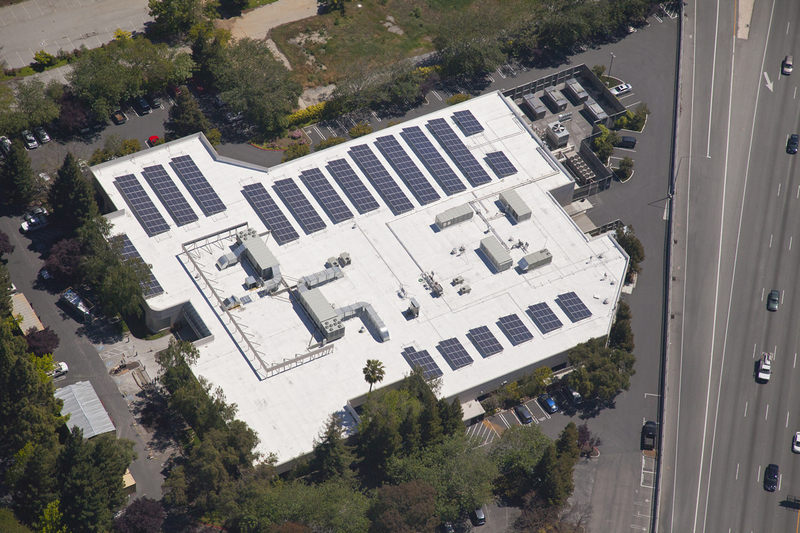 Project Type: Roof integrated solar installation with day lighting. 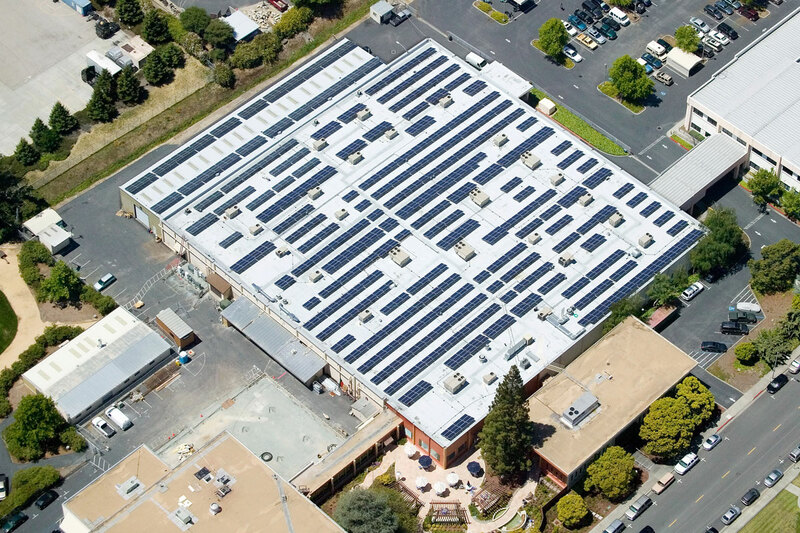 When Plantronics decided to go solar they turned to CCC as their roofing partner. 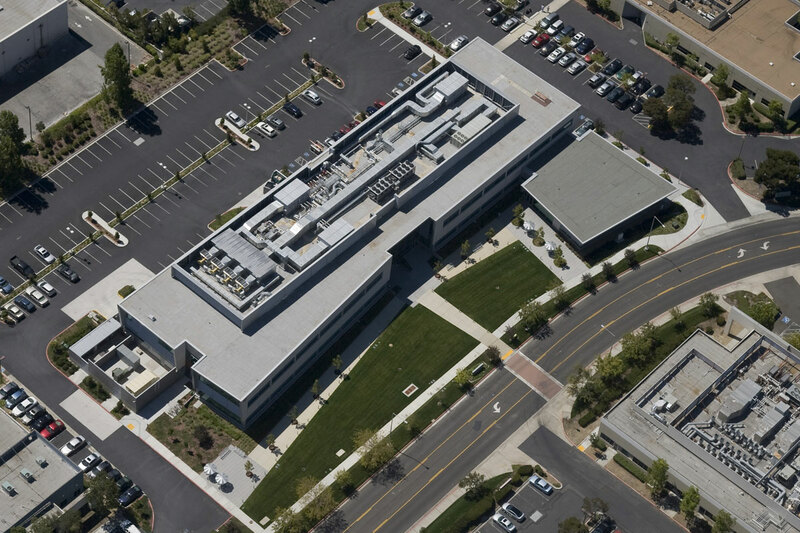 In addition to a new insulated roof and photovoltaic power generation, Plantronics wanted to improve the lighting efficiency of the building with the use of sun-tube skylights. 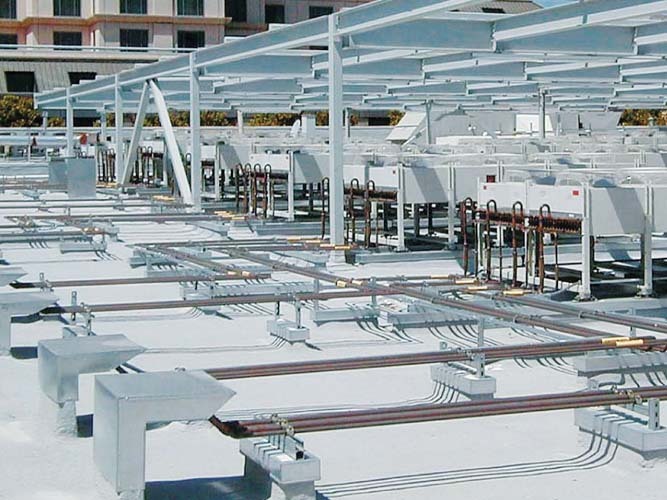 CCC installed its SmartStand™ solar racking which provides an integrated roofing and solar racking solution. CCC also sealed over 120 sun-tube skylight roof penetrations which eliminated the need for lighting throughout most of the building. 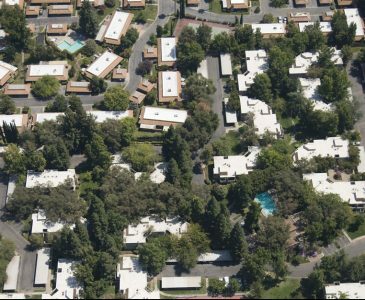 Client wanted to eliminate roof leaks and take advantage of Sacramento Municipal Utility District (SMUD)’s cool roof energy rebate program. 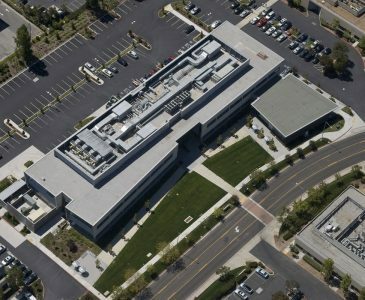 Client had multiple buildings in a campus setting. 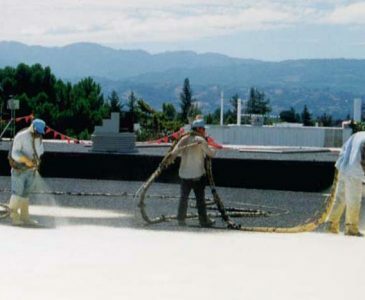 In phase I CCC replaced leaking skylights which were not CAL-OSHA compliant, filled deflected areas where ponding water existed and installed a new energy efficient “Cool Roof” roofing system with bright white reflective coating and granules. Client received a $0.20/sq. 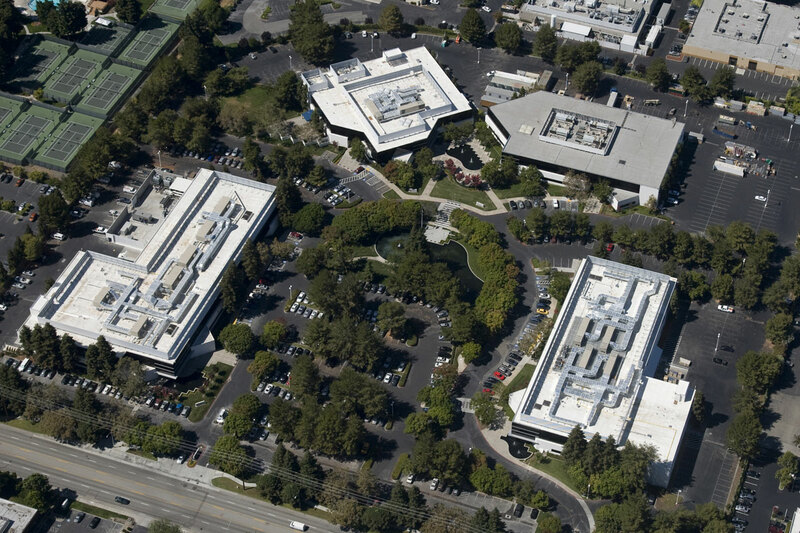 ft. rebate from SMUD, Phase I was so successful that CCC was brought back to do three additional office buildings. The existing asphalt roof had failed as a waterproof membrane and as a vapor barrier. Maintenance costs were escalating and valuable electricity was being wasted. After the SPF roof and vapor barrier coating system was installed, the frost and ice inside the building has dissipated (evaporated). 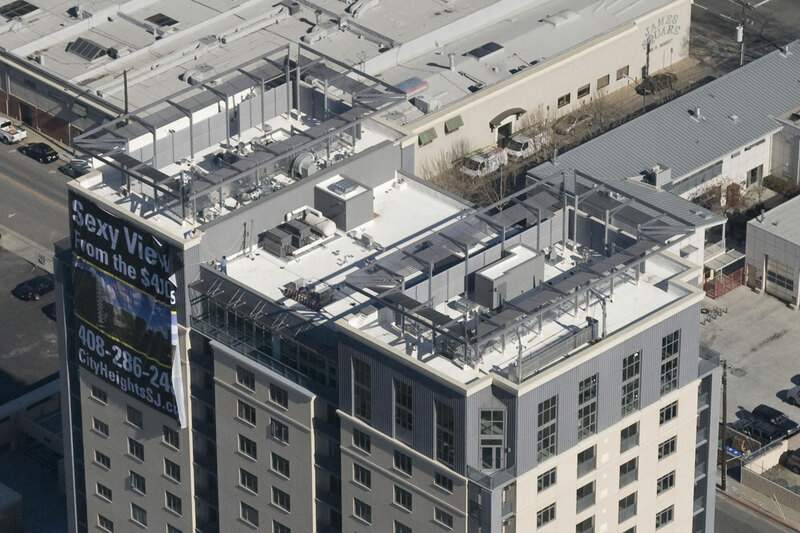 A review of electricity bills from before and after installing the SPF roof and vapor barrier on the Union City project showed a savings of $8,000 per month. The entire cost of the project will be recovered in approximately seven years. Central Coating’s first ElectroRoof® project, designed to demonstrate the synergy of integrating an SPF roof to save energy and a photovoltaic (PV) panel installation to generate electrical energy. Stanchions to support the PV panels were installed on a new plywood deck and permanently sealed as the new SPF roof was installed. 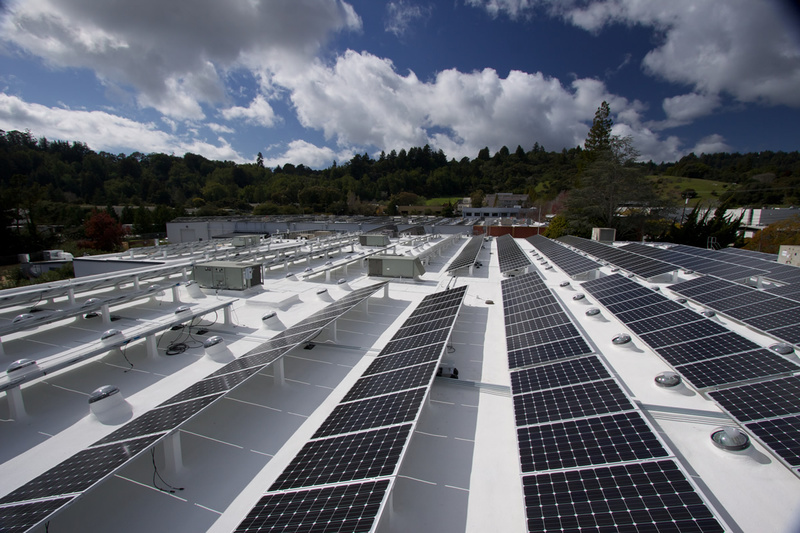 The PV installation not only generates electricity, it is a research facility. 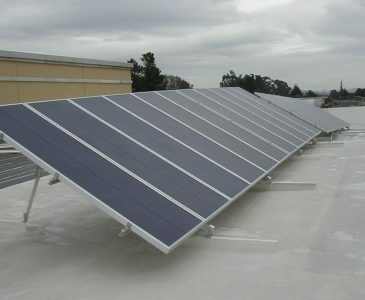 The performance of several photovoltaic arrays of different panel types, and panel tilt angles can be monitored separately. Working on a super fast track schedule to provide the roof on a building that is literally covered with equipment and thousands of roof penetrations. SPF roof, due to its fluid nature, easily conforms to the shape of various roof penetrations providing a water tight seal. Central Coating Company worked with the general contractor to meet or exceed all schedule requirements. Client constructed new warehouse for olive can storage and needed a leak free storage facility. 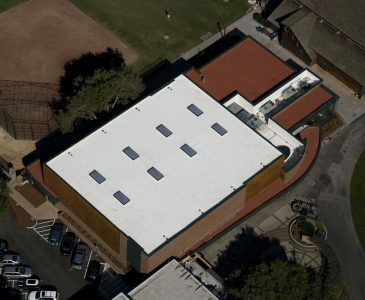 CCC was brought in by Food Pro International to install a 100% seamless SPF roof system. 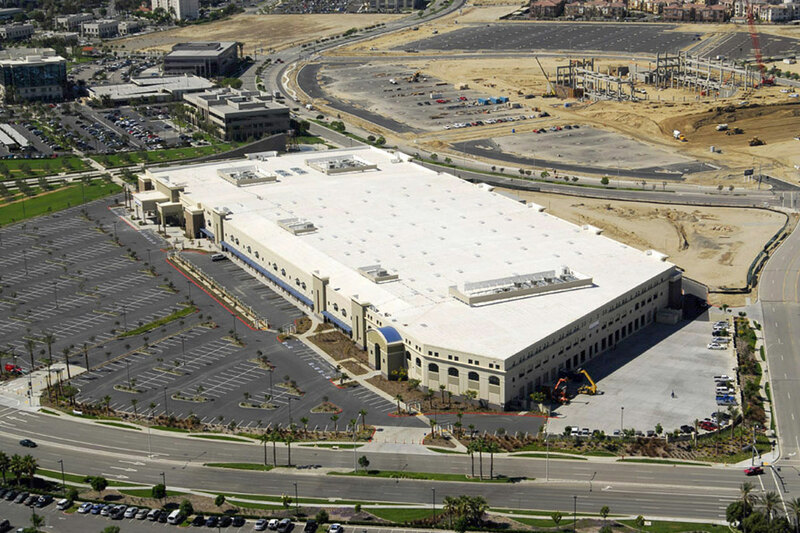 Due to the success of this project we were invited back to complete Phase II and III of Musco’s plant expansion as well as roofing the office building and processing area. 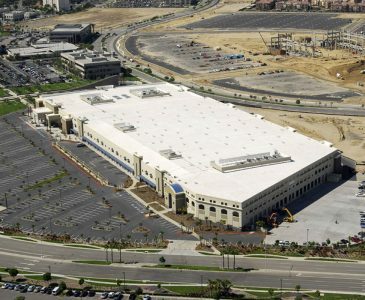 Re-roof 70,000 square foot building in one weekend.